In a cold-weather state, especially following the brutal winter of 2013-2014, you probably rewarded yourself several times over for weathering that stormy season. Even the smallest amount of creature comfort was needed after a winter of slogging through slush and shoveling mounds of snow ‘til you could stand it no longer. When the spring finally arrived, then the summer, you kind of forgot about the perils of winter … humans are somewhat resilient like that. But your house, no doubt the biggest asset that you now have, or will ever have, took quite a beating during that brutal winter as well. And the summer sun, though it has been scarce of late, also wreaks havoc with your paint job over the years. Maybe your house could use a little vitalization. The easiest way to refresh your home’s façade is treating it to a fresh coat of paint. In a home with a traditional-style architecture, your best bet is not to stray too far off the mark as to your current color of paint. Not that you can’t experiment a little and go with a darker hue or a new color combination, but sometimes, just refreshing the color with a fresh coat of the same color of paint is the answer to any exterior home doldrums you might be experiencing. A traditional-style home is generally more conservative as to the exterior paint color. Your best bet for color combos for your home are more in the neutral or light color palette with a complementary darker color added for interest and accent. The most-popular color for a traditional-style home is white. Bear in mind, that there are various shades of white … from light white to bright white. To get the true color of white which you will end up with after your painting project is complete; it is a good idea to compare paint chips in the bright sunlight to pick the most-perfect shade of white for your home. Matching the complementary accent or trim color is easy. Pick a color to accent any trim, decorative window shutters and/or frames, front and side/back doors or garage doors. This contrasting complementary color will add interest and appeal to the white and not make that house body color look blah in the least. Make sure to use good quality paint for color so that it never “runs” onto the white paint – a disaster for sure. Colors for accent can run the gamut from a tame light rose or even pale teal to various shades of gray or darker hues of blue. Keeping your home’s exterior color white and bright will require occasional touch-ups due to air pollution and even the inevitable road construction which kicks up a constant dust bath. Power washing that white exterior color works fine and keeps that paint job from looking dingy between touchups, but do ensure you use a good quality paint and give it two coats, with plenty of drying time in between, to ensure the paint adheres properly and does not become chalky or end up in trails on the non-painted surfaces of the home. Bearing in mind that the color white is rather high maintenance sometimes, there are certainly other traditional exterior house paints that will look superb on your traditional-style home. Some other popular combinations would be: dove gray or pale gray with a bold accent darker gray for trim and even straying to a third color for accents such as shutters or doors of cranberry or crimson. Staying with the reddish-rust tone theme, think about reddish-rust accent colors combined with ecru or eggshell as the main color for the exterior. You can use paint colors in reddish-rust and using a stain on wooden doors or accent spots will harmonize nicely and give your home a little oomph, but still in keeping the traditional look. Whatever color from the neutral or pale palette you choose, you cannot go wrong with a darker trim for a rich and elegant look to your home. If you’re willing to try another color combination for your home, but don’t want the added expense of repainting right away if you’ve made a bad color choice, why not consult with an experienced exterior painting contractor in East Brunswick? That person will be able to advise you on the best exterior color combination for your home and the perfect paint for durability, thus requiring less-frequent repainting or even touch-ups. An exterior paint project for your home is rather a formidable task and best to be undertaken by a professional so you can count on a perfect paint job at the project’s completion. Color coordinating your home’s hue goes beyond just the paint on the end of the roller or brush. 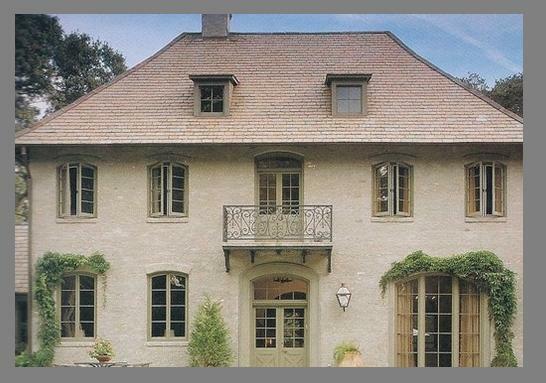 Don’t forget to match your exterior paint color to your roof and any tinted cement or paver bricks so they don’t clash. It is fairly easy to coordinate your garden with your home’s exterior colors. You don’t have to plant your flowers and gear your landscaping solely according to the color chips, but picking up some colors of the exterior façade and also matching porch pots to shutters or your front door will go a long way toward added curb appeal and solidifying your home as the best on the block. For garden beds or walkways, use decorative pebbles, lava rock, river rock, or even various colors of mulch that are now available in wood or rubber mediums, all which will add interest to your landscaping. It’s easy to change the façade of your home with a little house paint – just pick the right color, and be prepared for a brand-spanking new look.